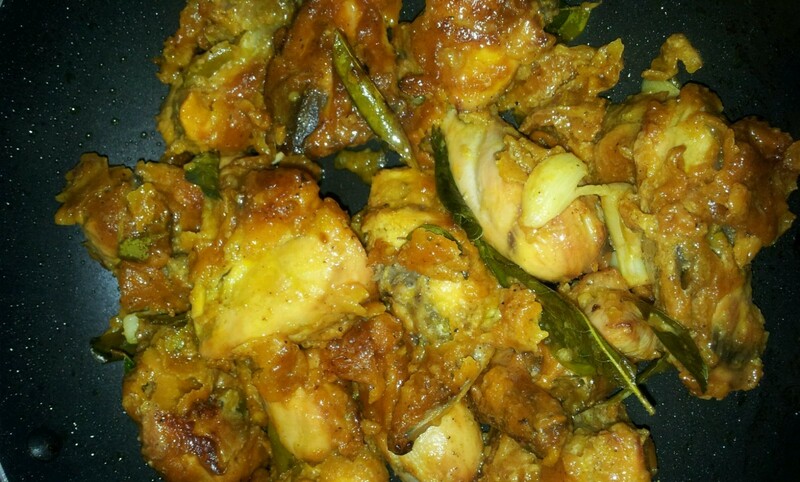 CHICKEN 65 is spicy and extremely yummylicious and mouth-watering dish of South India. The Chicken 65 has its origin from Chennai, Tamil Nadu. Usually, it is served as starters, snacks but some like it in main course. I’d never been to South India but I am very much fascinated towards the South Indian dishes like dosa, idli and Chicken 65, of course. There are many stories behind the name of this South Indian dish, Chicken 65. One reports that in a Chennai military canteen, this Chicken dish was on number 6 on the menu card. When the soldiers would want to order it, they would simply ask for the number 65 and, thus, the name Chicken 65 came into being. The other story reveals, to make this dish, it would take almost 65 days to prepare; another one says since Chicken 65 was a combination of 65 spices, hence the name. While another story reveals that Chicken 65 was introducd by Buhari Hotel in Chennai. Whatsoever is its origin, I like the dish very much and I bet once you cook it for your dear ones (like I did) your Chicken 65 will be more in demand! Chicken 65 can me made in various ways. Usually Chicken 65 is made with the boneless chicken but here since I was making it at home I’d taken the chicken with bones. It’s up to you whether you want to make it boneless or along with bones. This dish is full of protein, and gives an amazing taste. It is very soft, juicy and crispy in texture. So, make it on your own. I promise you won’t go to the restaurant for Chicken 65 next time because you already know how to make the yummylicious Chicken 65. I didn’t add eggs in Chicken 65, as I don’t like the taste and smell of it. Instead I have used yoghurt. Try this eggless form of Chicken 65. Chicken 65 is much popular in Andhra Pradesh and Telangana too. Here is the recipe of Chicken 65 Hyderabadi style. Get ready to cook home-made lip-smacking Chicken 65. Cook it nicely and enjoy your day. Take washed chicken in a bowl. Add 2 tbspn of beaten and creamy texture yogurt to it. Add ginger garlic paste, turmeric powder (haldi), sugar, 1/2 spn vinegar, salt, red chilli powder, kashmiri red chilli powder and 7-8 chopped (or crushed) curry leaves to the chicken. Mix well. This marinade should be done for at least 6-7 hours. You can add a teaspoon of coke in the marinade, to make the chicken more tender. Refrigerate the chicken marinade. 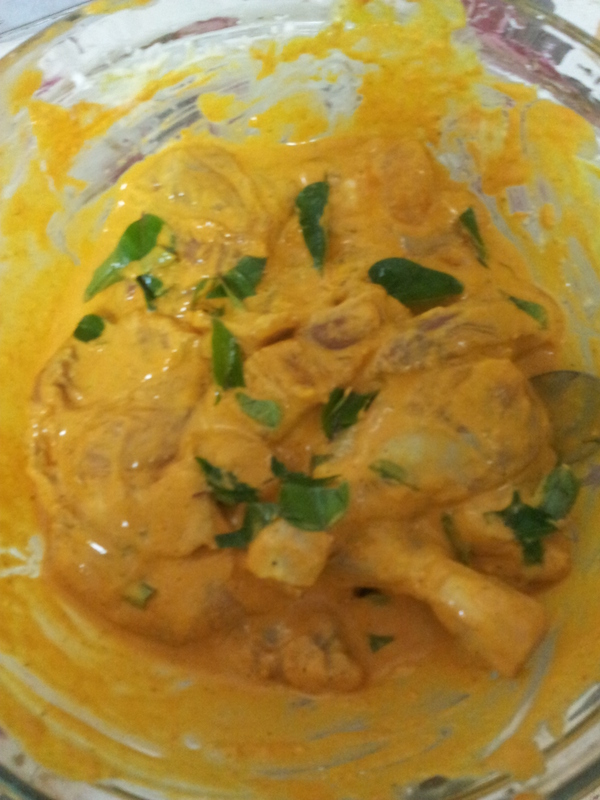 After 7 hours take out the chicken from refrigerator, add maida (all purpose flour) and cornflour to it. Mix well and deep fry until it is done. While you fry the chicken, you can prepare the sauce side by side. To prepare the sauce, take a bowl add 3 tbspn of beaten, creamy yogurt, black pepper, red chilli powder and a pinch of kashmiri red chilli powder. Take 3-4 cloves of garlic, crush it using mortar and pestle. Add crushed garlic, yogurt, 1/2 tspn of vinegar, sugar and very less amount of water to make it to a saucy consistency. Your sauce is ready. Sugar is added to the sauce to remove the smell of the garlic. After deep frying the chicken dry it on the paper towel. In a wok, add 1 tbspn of oil. Heat it. Add 3-4 cloves of crushed garlic, cumin seeds (zeera) and 10-15 curry leaves. Fry it until it becomes brown in colour pour the prepared sauce and mix well. After 2 minutes, add fried chicken. Mix well and stir for 4-5 more minutes or until the watery texture disappears and it becomes dry. Serve it hot in a serving dish. Here is the Chicken 65 ready. After taking its sour, spicy and delicious taste, even you can’t stop yourself to make it again. TIP: Beat the yogurt nicely and make it in smooth or creamy consistency otherwise it will coagulate in the oil. Wonderful shumy, wanted d recipe. Nw make 4 my son in summers. Thank You 🙂 . Let us know if you are looking for something specific and didn’t find here. It really feels great that you liked our recipe. Do share the pics with us.